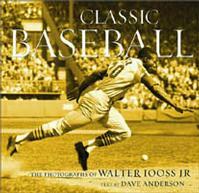 Title | Classic Baseball: The Photographs of Walter Iooss Jr.
Notes | Joe Dimaggio, Sandy Koufax, Cal Ripken, Sammy Sosa: more than mere athletes, these men, with their superlative physical skills, grace under pressure, and all-too-human foibles, rank as classic American heroes. Here, world-famous photographer Walter Iooss Jr. presents equally classic images of baseball greats of the past 40 years. Combining nostalgic postwar-era portraits with action shots of today's most popular players, and enhanced by the commentary of Pulitzer Prize-winning columnist Dave Anderson, Classic Baseball offers the definitive illustrated account of the sport since the 1960s. Special features like a six-page gatefold, collages created by Iooss exclusively for the book, and several never-before-published images make this the natural follow-up to Abrams' top-selling Baseball's Golden Age. While still in high school, Walter Iooss Jr. received one of his first assignments from Sports Illustrated: to photograph Roger Maris's attempt to break Babe Ruth's home run record. His work today includes both sports journalism and advertising photography, and he is the photographer of the bestseller Rare Air. Iooss lives in Montauk, New York. Pulitzer Prize-winner Dave Anderson writes three sports columns a week for The New York Times and is the author of some 350 magazine articles and 22 books, including the bestsellers One Knee Equals Two Feet and Everything Else You Need to Know about Football and All Madden: Hey, I'm Talking Football, both with John Madden. He lives in Tenafly, New Jersey. Comments | [07/17/03] I finally got a few hours last night to really spend some time with Walter's latest book. I wasn't disappointed. Needing some baseball to fill the night after the All-Star game blues I turned to "Classic Baseball" and was taken back thru the last 40 years of baseball thanks to Walter. I have all of Walter's previous books and was pleased to see many new photographs in here that I had never seen before. A gatefold sequence of Sandy in the 1965 Series in Minneapolis. Roger Maris hitting 61 from right field at The Stadium (reminded me of shooting Bonds #73 from a similar spot in San Francisco) was a cool picture of Walter's I had never seen. You can never get tired of seeing a young Pete Rose at Wrigley, Joe D. holding court in a God-like scene in the Yankee clubhouse after a 1980 old-timers day, and who doesn't love seeing Reggie pose for Walter at the plate after going deep in a game. It's all here and much much more from pictures of Walter's dad to original ticket stubs Walter Sr. used to watch games with at Ebbetts Field. This book is a must have for any sports photographer. Loves Park | IL | U.S.A. Comments | [04/29/03] Whenever you get a book from Walter Iooss, you know it's going to be one heck of a ride from the beginning to the end. Awesome. Comments | [04/29/03] Anything by Walter Iooss Jr. is a must-have for the eager amateur photographer to the seasoned veteran. Buy this and you won't regret it!